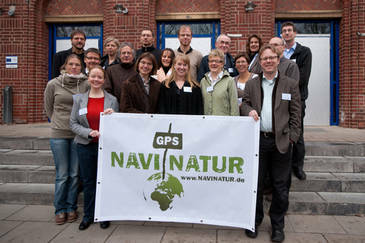 The latest project of NaviNatur was the school partnerships between Romania and Germany. Through personal meetings between students of different nationalities an exchange between Eastern- and Western Europe took place. The fundamental question was: What kind of understanding for sustainable development in their region do the pupils have? Following this question they developed GPS-tours. The following five schools were involved in Germany and Romania in the pilot phase: On the German side the Marion-Dönhoff-Gymnasium Mölln, the Haupt- und Realschule Salzhausen and the Integrierte Gesamtschule Lüneburg, in Romania the Liceul Teroetic "Joseph Haltrich" Sighisoara (Bergschule Schäßburg) and the Secondary School in Sf. Gheorghe in the Danube Delta. The project was funded by the Deutsche Bundesstiftung Umwelt (DBU) from November 2011 until Juli 2013.